Malvern House London möchte Sie gerne von seinem Sprachschulprogramm überzeugen. Wie könnte das besser gehen als mit kostenlosem Probeunterricht? An Dienstagen und Donnerstagen stehen begrenzte Plätze für Sie zur Verfügung, die sich nach einem Test besetzen können. Dabei lernen Sie einen Lehrer und seinen Unterricht kennen und erfahren etwas über die Stimmung in der Klasse und in der gesamten Schule. Bitte haben Sie Verständnis dafür, daß der Probeunterricht nur an bestimmten Tagen mit begrenzten Plätzen abgehalten werden kann. Deshalb melden Sie sich am Besten mit dem Online-Formular an. Geben Sie bitte bei "Bemerkungen/extra Kurse" an, an welchem Tag Sie Probeunterricht (Dienstag oder Donnerstag) wünschen. Ihnen wird dann eine Bestätigung zugeschickt, in deren weiterem Verlauf Sie auch einen Termin für Ihren Probeunterricht erhalten. Leider kann keine Unterkunft gebucht werden, wenn Sie nur Probeunterricht belegen möchten..
"The greatest benefit for me was the ability to determine my career goals and make a step into my desired direction. The ABE course introduced me to Human Resource Management and I’ve now received an unconditional offer from King’s College to study a Masters in Human Resource Management. I believe that having an ABE Diploma was one of the key reasons." "The Malvern House crew have the qualifications to make you learn English properly an they make the classes enjoyable, practising all the time to create a good social environment. The Fast Track Programme is awesome because it includes all the skills you need to manage the language. When I first got here I lived in a home stay and it was great. The family made my life easier in the first days, making me feel at home. The social programme is a good way to get new friends and visit iconic places in London. My favourite event was football on Saturday with the school and visiting places outside of London. I think Malvern House is the best international language school." "I wanted to learn English in the UK and was not sure of the best way how to learn the English language. I looked online at English language courses London and found Malvern House.The centres are all very modern and also have lots of facilities such as Wifi, where I can chat to friends back home. I also enjoy the social part of the college and have made lots of friends while living here. I really enjoy my classes and have been able to improve on my English. 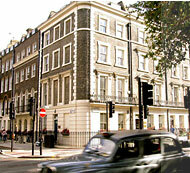 I would recommend Malvern House to anyone wanting to study English in London." "The main reason why I chose Foundation course in Malvern House is purely because I wanted to prepare myself for university life, be able to pass the exams (IELTS) and generally discover typical English life and culture. It is undoubtedly true that the Foundation course I had took in Malvern House not only helped me to get a place at university and learn English language,but also I found new friends and met very smart and friendly teachers. Even now when I'm away from London,I still get in touch with my new friends and teacher through the Internet. In addition, with your help I was able to apply for universities and receive an unconditional offer. Thank you very much to all of you."